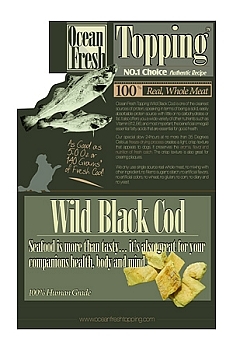 Ocean Fresh Topping Wild Black Cod Seafood is more than tasty… it’s also great for your companion health, body and mind. Ocean Fresh Topping Wild Black Cod is one of the cleanest sources of protein, speaking in terms of being a solid, easily absorbable protein source with little or no carbohydrates or fat. It also offers you a wide variety of other nutrients such as Vitamin B12, B6; and most important, the beneficial omega-3 essential fatty acids that are essential for good health. Our special slow 24hours at no more than 35 Degrees Celsius freeze-drying process creates a light, crisp texture that appeals to dogs. 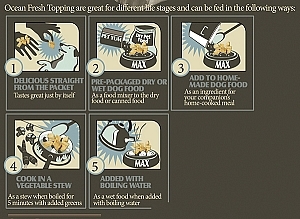 It preserves the aroma, flavor, and nutrition of fresh catch. The crisp texture is also great for clearing plaques. We only use single source real whole meat, no mixing with other ingredient, no filler, no sugar, no starch, no artificial flavors, no artificial colors, no wheat, no gluten, no corn, no dairy and no yeast.